A python was caught on camera devouring a crocodile after an epic battle on the shores of an Australian lake. Amazing footage of the incident shows the snake constricting its prey and slowly stretching its mouth over the crocodile’s scaly body during the course of five hours.The reptile death match captured the attention of people at Lake Moondarra, near Mount Isa in the state of Queensland, over the weekend. Though the stomach-turning meal may look incredible, some animal experts say the incident isn’t all that uncommon. “The big eat the smaller,” Lindsey Hord, a biologist with the Florida Fish and Wildlife Conservation Commission (FWC), wrote in an email to Live Science, noting that big snakes regularly eat crocodile relatives known as caiman in South America. Phillip added that snakes regularly swallow prey 75 to 100 percent their size. But footage of their amazing eating abilities continues to astound. 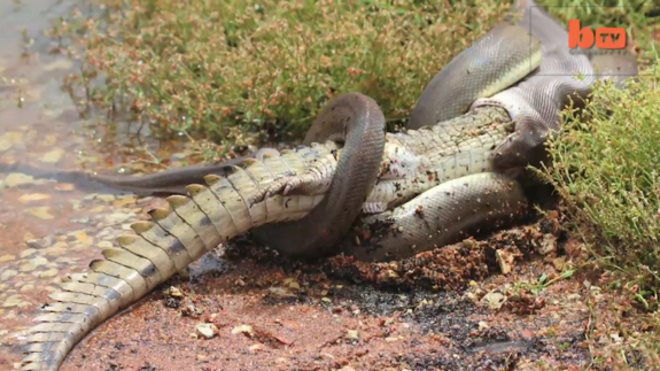 A sensational YouTube video from 2012 showed an anaconda regurgitating the carcass of a goat . And an engorged Burmese python was picked up in the Florida Everglades in 2011 after it had swallowed a 76-lb. deer. But sometimes snakes can bite off more than they can chew. Back in 2005, pictures circulated of another python that burst after it apparently tried to eat an American alligator in Florida. Snakes don’t “unhinge” their jaw to eat; rather their two lower jaws are not actually connected so they can move independently of one another while the snakes eat their large prey. Scientists recently decoded the genome of Burmese pythons and found the snakes’ impressive snacking skills arise from a genetic capacity to alter their metabolism and their organs (which sometimes double in size) after a meal. That research was published in December in the journal Proceedings of the National Academy of Sciences. I saw an amazing photo once of a python that ate a deer. The meal was so large the snake’s flanks split, but not far enough to kill it. When they eat meals that big they have to stay in that spot digesting for weeks before it will be able to move at all.